Paint fun, a photo by PhylB on Flickr. 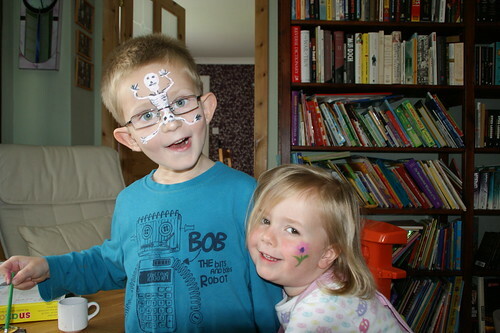 Eighteen months ago when Hazeldene Nursery told us Léon had failed his eye test, we were more than surprised. Neither Marcel nor Lots has any eyesight problems and I didn't get my first reading glasses till a few weeks before my 41st birthday. We took him to the hospital follow-up and were told he was long-sighted and would need glasses at least till he was a teenager, if not permanently. So the fun and expense of keeping glasses unscratched, unbroken, unlost etc began. I immediately tried to get Anna's eyes tested at the time. Opticians refused because she was under four. I tried in vain to get the hospital to look at her when I was there with Léon. I asked for a doctor's referral but was told she would be checked at four anyway. She isn't four until next month but the nursery contacted us last month to say she too has now failed her nursery sight test. Yesterday, I phoned the hospital who said she'd be receiving a non-urgent appointment at some point in the future. Léon's first appointment had taken nine months to come through. I wasn't going to put up with that again. After speaking persuasively to them for half an hour Anna has now been given an appointment next week. Given the hassle value of glasses and small children, I really hope they've made a mistake, but Anna is so excited about being old enough to get glasses just like her big brother, she's already picked out a pink pair in Dollond & Aitchison so if they tell her she doesn't need them she's going to be beside herself! HOW SWEET CAN ONE CHILD BE?